Snapshot: The Remington Keratin & Argan Oil Nourish AC8820AU is a 2200W hairdryer with 2 speed settings and 3 heat settings. But how well does it dry hair? Has a cool shot feature. Controls are extremely easy to operate while using the hairdryer. Good styling score from user panel. Does not have a diffuser. Our lab assessed performance, then our panel put the hairdryers through their paces in the real world to test ease of use. Average price is from an April 2018 survey. To test performance we measured drying rate, airflow speed and temperature range. Drying rate measures how quickly the hairdryer dries your hair. To do this we wet a cloth and measure the drying time with the hairdryer, 15cm away from the cloth. We measure how fast it dries on the lowest and highest heat setting and lowest and highest air speed settings. Airflow speed measures the range of airflow speeds at the lowest and highest settings, 15cm from the air outlet. Temperature range measures the range of temperatures at the lowest and highest settings, 15cm from the air outlet. 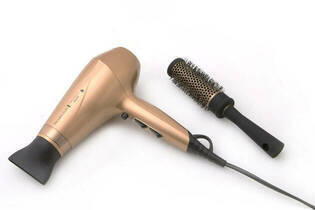 To assess ease of use, triallists used five hairdryers on two occasions. We wanted to know how comfortable the hairdryer was to hold, how easy the markings on the hairdryer are to read and understand, how easy it is to operate the air speed and temperature controls while using the hairdryer, and how well you can style your hair with the hairdryer.